We're now OFFICIAL national distributors of DUSTEX TM Request a price NOW and SAVE! 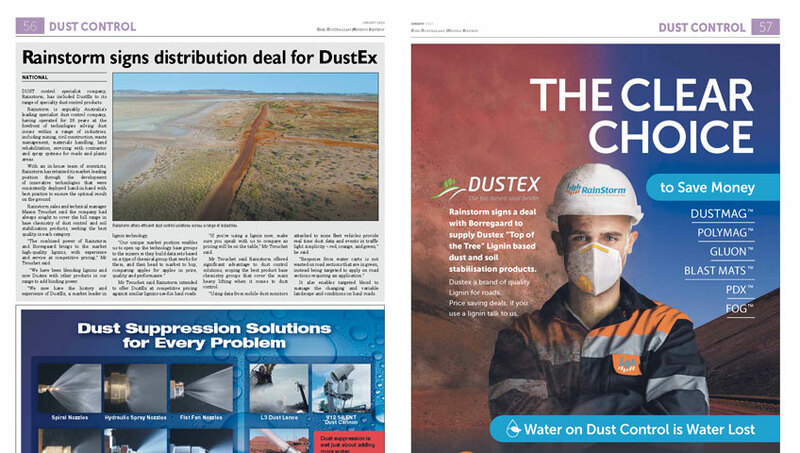 In this recent article in The Australian Mining Review, Rainstorm sales and technical manager Mason Trouchet explains how the industry will benefit from this new distribution deal between Rainstorm and Borregaard. dust issues within a range of industries, including mining, civil construction, waste management, materials handling, land rehabilitation, servicing with contractor and spray systems for roads and plants areas. With an in-house team of scientists, Rainstorm has retained its market-leading position through the development of innovative technologies that were consistently deployed hand-in-hand with best practice to ensure the optimal result on the ground. Rainstorm sales and technical manager Mason Trouchet said the company had always sought to cover the full range in base chemistry of dust control and soil stabilisation products, seeking the best quality in each category. “The combined power of Rainstorm and Borregaard brings to the market high-quality lignins, with experience and service at competitive pricing,” Mr Trouchet said. Mr Trouchet said Rainstorm intended to offer Dustex at competitive pricing against similar lignins used in haul roads. “If you’re using a lignin now, make sure you speak with us to compare as pricing will be on the table,” Mr Trouchet said. Mr Trouchet said Rainstorm offered significant advantage to dust control solutions, scoping the best product base chemistry groups that cover the main heavy lifting when it comes to dust control. “Using data from mobile dust monitors attached to mine fleet vehicles provide real time dust data and events in traffic light simplicity – red, orange, and green,” he said. It also enables targeted blend to manage the changing and variable landscape and conditions on haul roads.